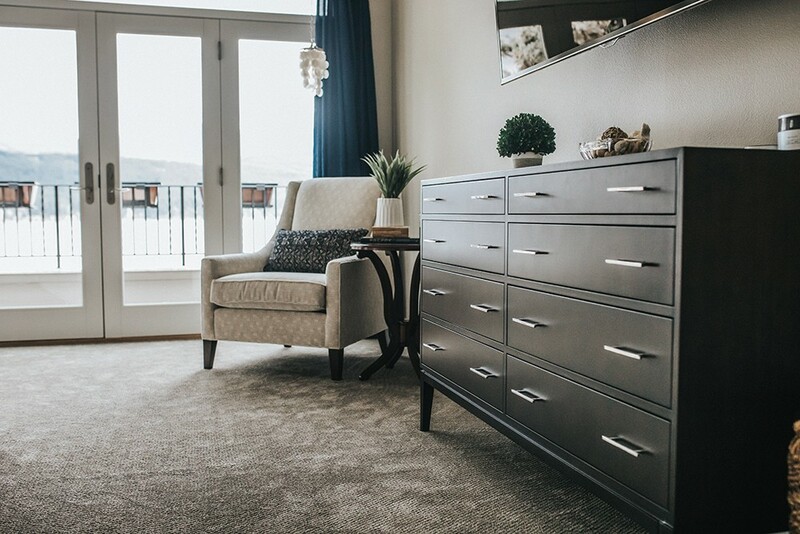 The Wozow master suite features soft colors, with an occasional pop of blue to complement, but not compete with, the sweeping Liberty Lake view. "I do not understand how anyone can live without one small place of enchantment to return to." For more and more people, that small place of enchantment is found right in their homes, within a master suite. Here, three local homeowners who have created master suites that provide a place to escape, rest and renew, are throwing open their doors and welcoming us into their places of enchantment. After Monica Wozow and her family moved into their Liberty Lake home, she was ready to claim a space for relaxation and renewal by redoing the master suite and lightening up the area in a house that was dark. "We wanted to create more serenity in the space," she says of the master suite that looks out over Liberty Lake. The previous year, Wozow had worked with Deanna Goguen, of Designology, to "soften" and lighten things up from the darker style in the house. Pleased with the experience and her ability to capture their desired look, Wozow turned to her again to update her master suite. "I wanted to create a monotone look so that the lake could shine through," she says. Originally, Wozow wanted neutral colors because they are more calming. "We went with neutrals," she says, "like taupes and whites, but ended up throwing in some bright blue because it was almost too muted for our taste." The blue accents draw in the blue of the water and lend a relaxed feel. "We had really heavy blackout blinds before, but now that we live on the water, we wanted to see the sun coming up in the morning," says Wozow. "When the moon is full, it is gorgeous. Changing out the blackout blinds for something that allows light in has made a great difference in the light in the room and the feeling that comes with the incorporating nature." 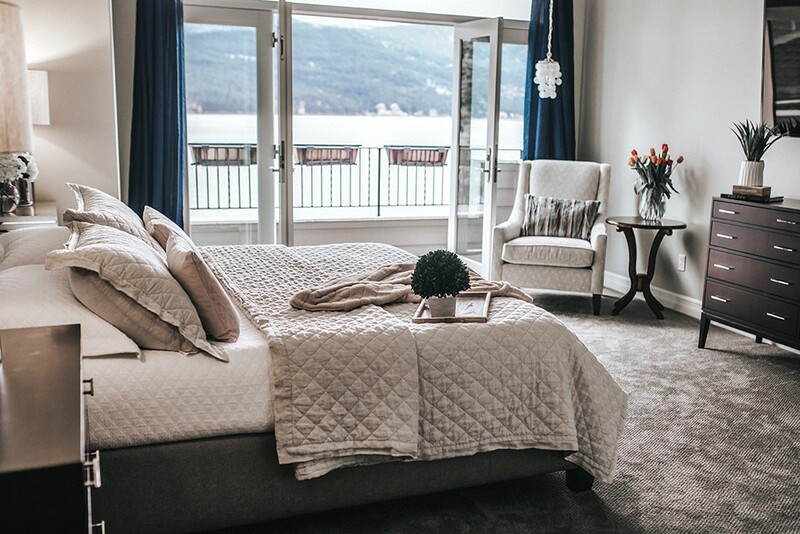 The Wozow master suite features soft colors, with an occasional pop of blue to complement, but not compete with , the sweeping Liberty Lake view. Wozow says the change was worth the investment. "It is gorgeous," she says of the finished suite. "It brings us the calmness we need." Busy with running two businesses, Wozow says she and her husband lead a life that is go-go-go. "Now we are happy to be able to stop and look around us and be calmed.You can be in your bedroom eight to 12 hours a day, so it is so important to create a space that creates calmness in your life. It helps you start your day and end your day in a peaceful way." Sharon Grunwald has long known what she likes in her homes, so when it came time to build her current home, she knew a few specific items that had to go into her master suite. 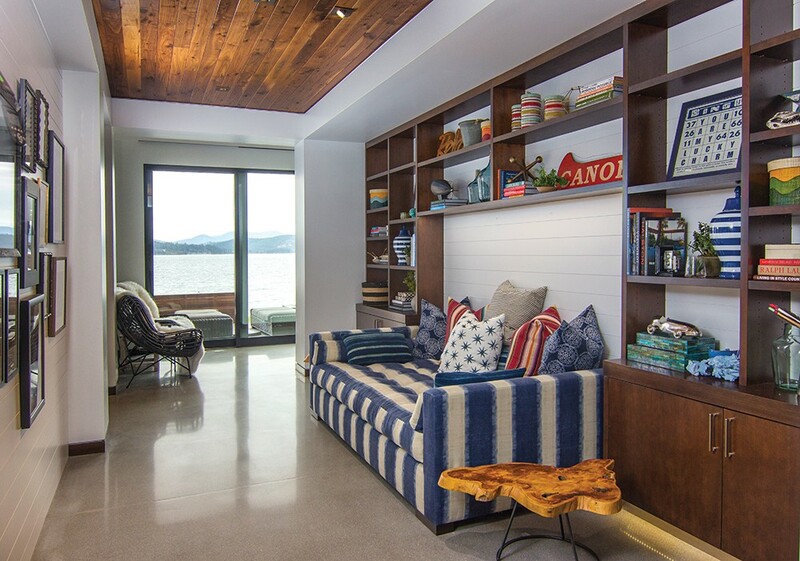 A dramatic fireplace complements expansive water views in this Coeur d'Alene master suite. "My primary goal in designing the master suite was to create a comfortable, elegant area, but understated," she says. "I tried to create texture with tile, carpet and bedding, but I wanted to walk in and feel peaceful, and taking advantage of the view was foremost in my mind." That view is equally unobstructed from both the bedroom and bathroom portions of the suite, so it's just a matter of deciding from where you want to enjoy the view: the covered, glass-enclosed deck, or the heated bathtub. Heated floors are well known — and yes, this suite has those as well — but a heated tub takes luxury to a whole new level. "The armrests and back are heated, in zones," says Grunwald, "and there is no need to add more hot water." For those preferring a shower over a tub, detailed, long-term thought was given to the design of the shower as well. It was specifically designed to be "curbless," eliminating the need to climb in and out, and was designed with a glass wrap around wall for visibility. A colorful reading library fills the hall space leading to the suite. "We did put specific thought into aging in place, as we designed the suite, and particularly the bathroom," says Grunwald. "The doorways are all 32-inches, which are ADA [Americans with Disabilities Act] compliant." Grunwald says the decision for the doors was to accommodate a wheelchair if anyone ever needed one, down the line, whether permanently, or post-surgery. When traveling, no hotel provides the luxury that Grunwald's master suite back home does. "It is pampered and peaceful," she says of having a space that is defined and reserved for yourself, and as a place to retreat to in the house. "It is well worth it." When Katie and her husband built their lakefront home in 2013, they worked with Eric Hedlund, of Eric Hedlund Design, to design a unique and inspiring master suite. "It is very neutral, clean and serene," she says of the style. "It is modern, but soft and comfortable." "The goal of the master suite was to create a quiet sanctuary away from the main portion of the residence and capture that amazing view that they can wake up to every day," adds Hedlund. Double doors of rift white oak lead into the suite from an exterior reading library hallway. Wood-lined ceilings bring a warmth and cocooned feeling, balancing with the open-air style created by the glass doors and ample amounts of light flooding the room. Anchoring the space is a long, open gas fireplace; its flames dance beneath a built-in media screen. 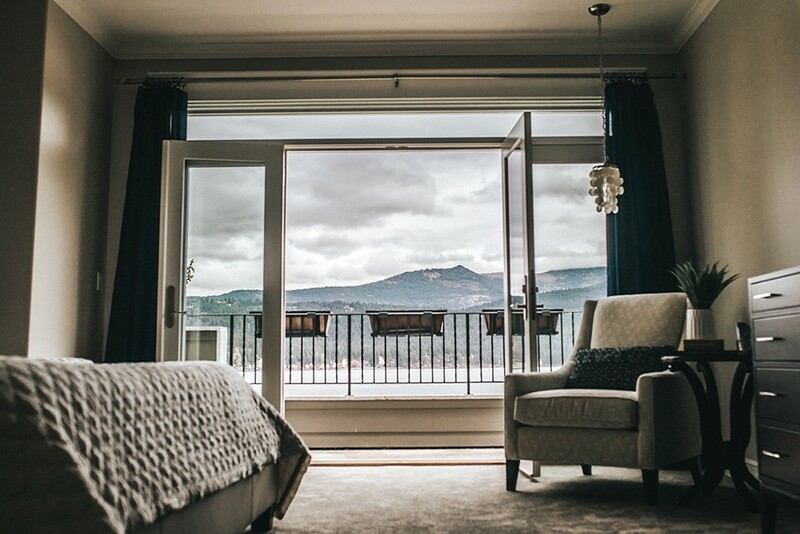 "We like nature to be an art piece," says Katie, of the stunning views of Lake Coeur d'Alene, which make the master suite the oasis that it is. Nature finds its way into the suite not only through the wall of doors to a patio, but also through the numerous windows that are incorporated at a variety of heights and locations throughout. The focal point of the suite is the soaking bathtub sitting atop a teak floor, under an amazing chandelier and with a mirror backdrop, allowing views of the lake any way you look. The teak floor is a raft upon the rest of the bathroom's concrete sea of flooring. Concrete is not only durable, but adds a contrast of texture and color; luxe and utilitarian, meshing perfectly. "It is very functional and not fussy," says Katie of the flooring choice for the bathroom. "It's a lake house, so you can't ruin anything here. We live here and we use it; that's the way we live." A grand walk-in closet caps the far end of the suite. "It feels luxurious because there is room, and everything is organized," says Katie of the layout. "I had a pretty clear picture of what I like, so it wasn't too difficult to pull it all together." A mirror behind the bathtub, which sits on a "raft" of teak flooring, brings lake views into focus from any direction. Good lighting is key! Make sure to include areas of low lighting, which soften the space and invite you to slow down. Utilize any view, but keep in mind the need to maintain privacy. Use as much natural light as possible. Heated floors in the bath are a true luxury (especially in the winter). Enclose the toilet! Even top-of-the-line toilets are best kept out of sight. Neutral colors are more calming, but bring in a pop of color to the room with items that can be changed out (pillows, bath towels, area rugs). Empty space helps an area feel more organized and calming. Use a variety of textures and colors to add depth to the room. Create spaces that are set aside from the rest of the room for reading. Remember you want to be able to live in the space. Make it a place you can use, live in and enjoy without fear of damaging it.